Learn about how we use dye sublimation to create your products and how to create your designs for the best results. When a solid turns to gas without being a liquid first it's called sublimation. This process gave dye sublimation its name, though it's since been discovered that some dye sublimation processes actually have a liquid stage - but the name stuck! Dye sublimation uses a combination of heat, pressure and time (in varying quantities depending on what's being printed) to shift dye from a transfer to a product. It's a digital print method that results in a near permanent, high resolution full colour print. This makes dye sublimation an amazing tool for product decoration, and since our catalogue of sublimation products just keeps expanding it would be super handy to know some best practices for creating your artwork. The heat, pressure and time required can only be applied once the dye is ready to go. This means all dye sublimation uses transfers. First we take your artwork and mirror it. Then we print a transfer using special sublimation inks and paper. Finally, we position this as accurately as possible and apply the correct amount of heat, pressure and time for the product you've ordered. Using transfers and heat presses makes it extremely difficult to match mockups; we can't guarantee placement since we can't see exactly where the transfer has been placed! But that being said, using the templates we've created for each dye sublimation product goes a long way towards correct placement. These templates are set to the recommended specs for your artwork so you don't need to worry about losing quality when using them. Please note: if you're placing your artwork into our templates it'll need to have been created following our design guidelines; placing low quality artwork into a higher quality file will not increase its quality. Our guidelines for sublimation are almost identical to other print methods because a high quality print starts with the print file! For all print files we ask for a 300ppi PNG with RGB colour values. This might be counter-intuitive but our software converts RGB to CMYK before it prints. The PNG format preserves any transparency in your artwork. Our dye sublimation printing software can't parse colour to transparent gradients. Creating a colour by reducing its opacity to blend it with the empty space beneath it creates a design element that our software simply can't read. Instead, it'll try to compensate for what it doesn't understand and the printed result won't look like what you've imagined. There are very few limitations to what you can achieve with dye sublimation. On a technical level it has the capability to reproduce high quality, full colour prints on any product capable of receiving the transfer dye. 1. Positioning can't be guaranteed. This (and the reasons why) was covered above. It's all down to the print method; covering the product with a transfer and a press makes it near impossible to position your artwork to match the mockup perfectly. 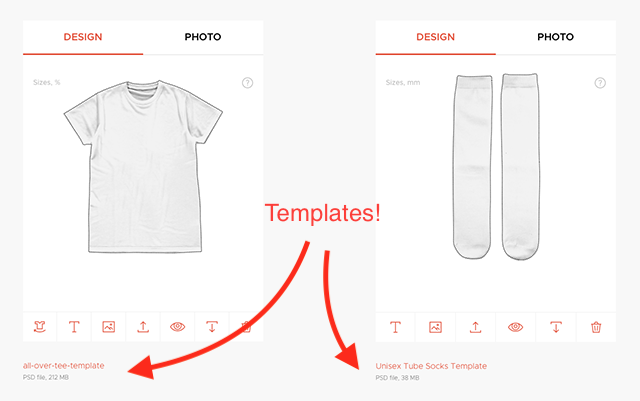 Ways to avoid: Use Inkthreadable's templates to create your artwork to the correct dimensions, create artwork that does not depend on positioning (patterns etc). 2. Creases in the print are expected. This depends entirely on the product being print (mugs and phone cases won't ever show creases) and the severity will vary from print to print. It's down to the products being manufactured before decoration. Think about an all-over sublimation t-shirt: you can lay a t-shirt as flat as possible but you can never guarantee that the fabric along the seams and armpits are crease free. The dye transfers to what it's touching, and if fabric is hidden in a crease it's not going to get printed. Ways to avoid: Fabric will always be white before printing so using designs with negative space will make creases less obvious. Artwork that fades to white from the waist up will leave armpits white by design, for example.